From the jungles of Ecuador to the boreal forests of Canada, local peoples around the world are fighting back against oil companies which foul the land and hoard their profits. In some places, like the hills of Nebraska, where farmers and ranchers have so far stymied TransCanada’s Keystone XL pipeline, this resistance comes in the form of petitions, protests, and legal challenges. But in other countries, in which disempowerment and corruption are even more rampant than in the United States (which is really saying something), Big Oil’s opponents have been forced to register their objections through violence. No oil conflict is more brutal and intractable than the one in the Niger Delta. For decades, foreign oil companies like Shell and Chevron have been sucking oil from the region with no regulatory oversight, shamelessly fouling the rivers and jungles upon which local people depend. In retaliation, gangs of guerilla fighters roam the delta in speedboats, waging sporadic war against the oil companies and the petro-funded military that defends the plunderers. The guerillas have met with some success: in 2008, their attacks on wells and pipelines forced Shell to evacuate oil fields and temporarily cease production. Yet the militants have also destabilized the region, incited violence against innocent villagers, and even killed the very people whose rights they claim to be defending. 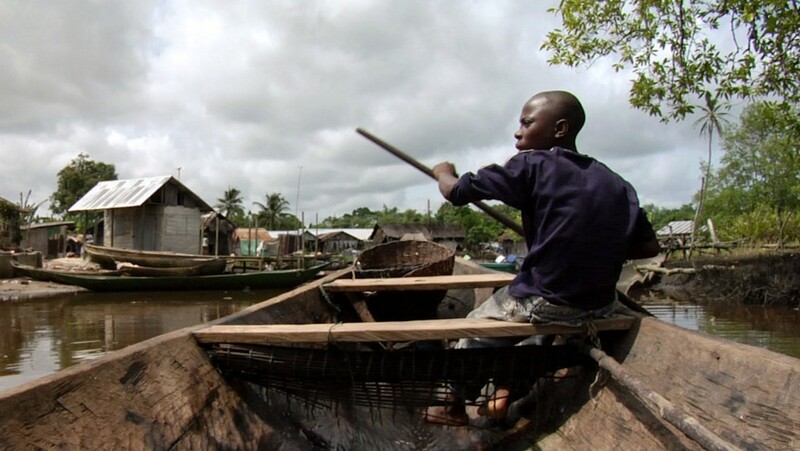 In 2008, filmmaker Andrew Berends traveled to the Niger Delta to embed with the guerillas and document the conflict. Berends was no stranger to violence: one of his previous films, The Blood of My Brother, told the story of an Iraqi family whose oldest son was killed by American troops. 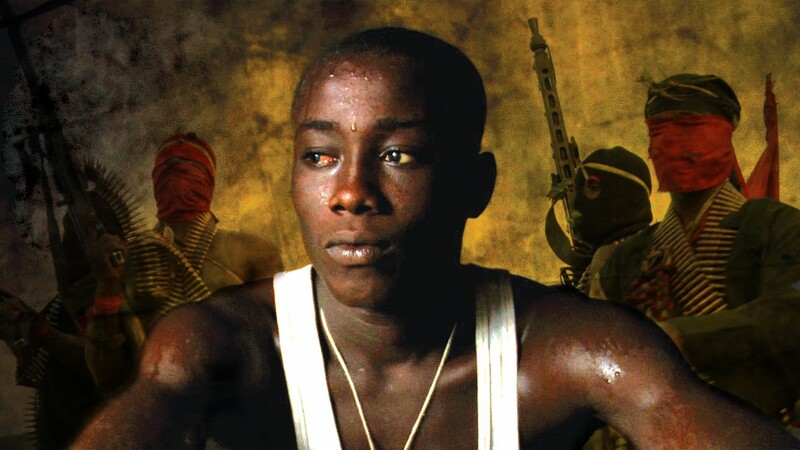 But in his new film, Delta Boys, he finds more than brutality or a simple parable of environmental destruction: he tells a moving, unsettling story about the teenage boys who are conscripted into the militant groups, and asks challenging questions about whether the guerillas are a force for justice or destruction. Delta Boys is available for digital download on Tuesday, October 16, through Cinedigm Entertainment Group and through the Sundance Institute Artist Services program. In advance of the film’s release, Sage spoke with Andrew Berends about his time in the Niger Delta and the region’s ongoing conflict. Sage: How’d you wind up interested in the Niger Delta? What’s the origin story of this movie? Andrew Berends: Well, I had just made two films in Iraq, and I was looking for another exciting project. And one day I saw footage of the militants in the Niger delta — these big muscly guys, with their guns and their speedboats, and I thought to myself, Wow, that’s exciting. That was the original hook, but then I did some research, and I realized what an important story this is. Not just in the Niger Delta, but also globally — it’s really about where our oil comes from, and the human cost of that oil. We use oil for everything we consume, and because we want it cheaply, people wind up suffering. You begin the film by exploring these environmental issues, but then you seem to get captivated by the militants themselves, and life in their camps. The movie really changes directions. To me, the experiences of people in conflicts are always most interesting. I don’t make the type of film where you go talk to an expert on one side, an activist on the other side, and a representative from Shell. It’s more meaningful to spend a lot of time with individuals, or with certain groups of people, and immerse yourself in their lives. So how did you go about immersing yourself? The access you get is amazing — you see a woman giving birth, which is one of the movie’s most incredible scenes. Was it difficult to earn that kind of trust and confidence? Initially it took a while. I actually went there one year, and after six weeks finally managed to get access to the camp. But then somebody in the camp changed their mind, and they left me alone in a village for a week. I was like, Forget this, this isn’t working, I’m going home, and I went back to New York. And for a year that bothered me — I kept telling myself that I should’ve stuck it out longer. So I went back and I followed up with the same contacts, and the first night I spent in Ateke Tom’s militant camp, mainly because they didn’t have anywhere else to put me. Living in the camp was really uncomfortable: the food is terrible, there are mosquitoes everywhere. There was one journalist who once spent a night in the camp, but all the other news reports I’d seen were from journalists who spent two hours in the camp and left, and filed a five-minute report. So the fact that I was willing to live in the same conditions as them, eat the same food, mattered to them. I shared a mattress with six guys. It was awful, one of the most uncomfortable experiences I’ve ever had. To bathe, you get a bucket of water, and I was so inexperienced that I didn’t know where to start. I was like, so where do you soap up first? Did you ever have the opportunity to go out with the militants when they left camp and went on raids? I wanted to, but there wasn’t much happening while I was there. I was constantly asking them –– not that combat is the only thing that I find interesting, but it’s a big part of the story. Then again, if you go with them, you’re going in a speedboat, and then you’re all in. You can always dive out of the boat, I guess, but that’s it. I had the same thing happen when I was in Iraq — I was in a couple of vehicles with the insurgents, and I hated that. I didn’t mind being on the street, even when they’re fighting, because you can always pull back around the corner and you’re okay. But if you’re in the vehicle and the Americans attack the vehicle, you’re stuck. And the same thing with the speedboat: if the Joint Task Force fights back, there’s nowhere you can go. The reality of guerilla war is that there’s not always a lot of fighting. And that’s what makes life in the camp so interesting. One of the most striking things about everyday life in the camps is that it’s pretty violent — there are some savage beatings and fighting amongst the militants themselves, and at times it’s hard to watch. What was it like for you to stand there and watch these defenseless guys get the crap beaten out of them, and why include that in the film? Well, you need discipline, or someone’s gonna get killed, and it almost seemed appropriate. When I’m doing this work, I kind of cut off emotionally in these kinds of situations, and then process it later. Still, there’ve been a few times when I’ve gotten emotionally engaged while I’m shooting, often when I see children suffering. When I was in Iraq, I was filming a family inside a city, and their house was hit by a missile from an American helicopter. And this seven year old girl is telling her story, and she says she was sleeping next to her mother, and the missile happened, and she rolled over and tried to wake her mother up, and she didn’t wake up. And meanwhile the girl’s injured, and her brother’s injured, and I was — I wanted to explode, I was so angry. I get most emotionally connected when children are collateral damage. It’s hard to draw the line in Delta Boys, though, between children and militants. A lot of the fighters are just teenagers who seem to have been seduced, or are in search of a better life. There’s no question that the socioeconomic conditions are terrible. Young men have no opportunity for jobs, no opportunity for education, some of them don’t have access to food… and then suddenly there’s this opportunity to join the militants, who give them a place to sleep and three meals a day. 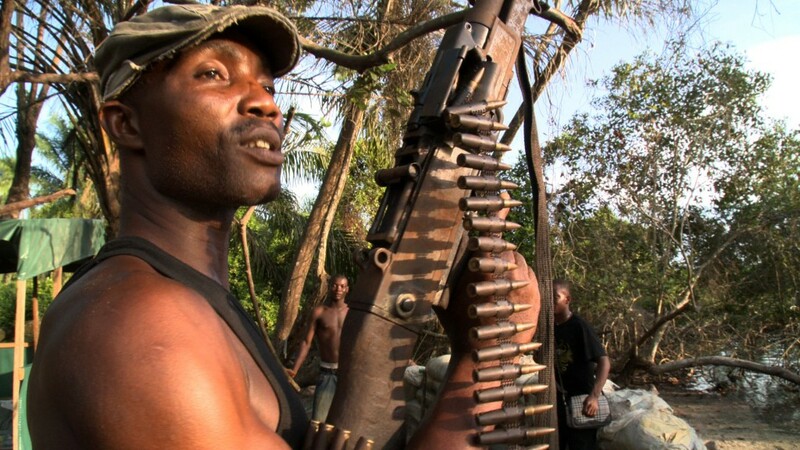 It’s very clear that the overall situation in the Niger Delta is what’s leading them into the militant groups. It also seems like they find the militant leader, Ateke Tom, very charismatic. What was it was like being around Ateke Tom, and did you get a sense of what makes him so beloved among his troops? I don’t exactly know where his mojo comes from. The first night I was there, he was like, “So do you want to be a part of me?” And I said, “Well, I want to get to know you, but I also want to get know all of these boys as well.” And he said, “Well, they are me.” So I thought, well, that’s scary. They use mafia terminology. He’s technically a don. They call him the Godfather. They think he’s the only guy who cares about them, so they’ll do anything for him, and he manipulates that. Even before this Niger Delta struggle, he was already a gangster. He worked for politicians to help rig elections, and that’s how he got his money and his weapons. He’s responsible for a lot of people, too, though. There are people and families depending on him. 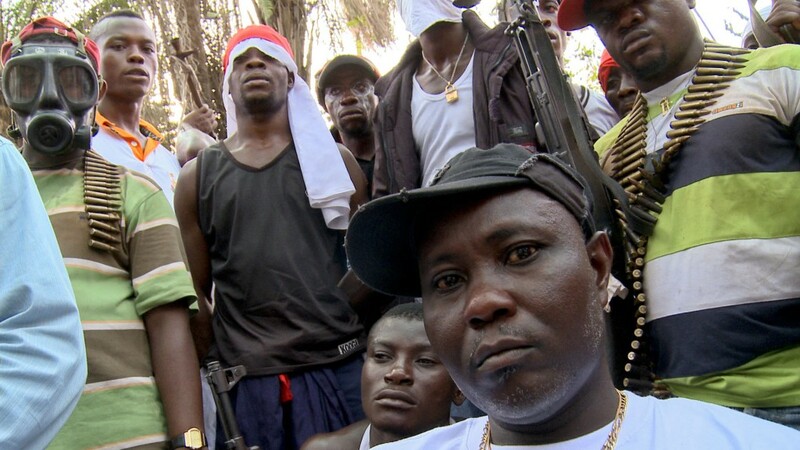 The militants’ leader, Ateke Tom, goes by the moniker “The Godfather.” Photo by Andrew Berends. But it seems that by the end of the movie, the villagers have kind of come to hate and fear the militants. The militants definitely don’t turn out to be what the villagers hoped they would be. And the villagers don’t want to get caught in the fighting. But it’s a symbiotic relationship — it’s not black and white. Sometimes the militants come spend money in the village, or give the villagers gasoline. And sometimes the militants are thugs and gangsters, and rob people on the creeks. Even though the cause that they’re supposedly fighting for is completely legitimate, there’s a big question as to whether the militants are truly fighting for that cause, or whether they’re just fighting for a piece of the oil money. Because the militants also engage in bunkering, which is the sale of black market oil — which seems not that unreasonable, actually. It’s their oil in the first place. Are they actually drilling for oil themselves? No, they tap into pipelines. And the military is involved in that — because we’re not talking a few barrels here and there, it’s millions of dollars of black market oil changing hands, and that means there are tankers going into the creek and going out filled with oil. In some cases, when the military is fighting the militants, it’s because one side or the other is not getting their cut. The bunkering couldn’t happen without some cooperation from the navy. Well, let me correct you. They offered amnesty for the militants, and they paid off the leaders. But what the militants were supposedly fighting for included actual development for the Niger Delta people — things like roads, and schools, and hospitals. My argument is that nothing has changed, and nothing’s gonna change, and the militants just took they pay-off. The regular people, like the girl who gave birth at the beginning of the movie, are in the same situation as they were before, and the next boys who come around also have no opportunities for education or for finding a job. So nothing changes. And it’s getting worse, because for these villagers and fishermen, their source of survival is those creeks and that jungle, and that’s being more polluted every year. There are over 300 oil spills in the Niger River every year, and they add up to more than the Exxon Valdez spill. Every year. And that’s in service of us — the world in general, but the West and the United States in particular — getting cheap oil. It always comes back to that. We want to let you know that we are very proud of the New Biafran Civil Liberty fighters and this the fist time all Biafrans (SS & SE) is supporting our military. God Bless You. (1) MINUTES OF THE NATIONAL & INTERNATIONAL MEETING TO MARK-UP REFERENDUM IN BIAFRA ON NOVEMBER 5, 2016 AT 9.30 A.M. SECRETARIES OF THE MEETING ON NOVEMBER 5, 2016 AT 9.30 A.M.
4. The Endowed Prof. (Dr.) Phillip Chukwuma Ofume. 4.b. The Endowed Prof. (Dr.) Phillip Chukwuma Ofume. MEETING STARTED AT 9.57 A.M. but other general discussions were going on before 9.57 a.m. The Endowed Prof. (Dr.) Phillip Chukwuma Ofume. introduced members and representatives in-attendance at 9.58 a.m. and requested all members and representatives to identify themselves and if they are in Nigeria, they should apply some reservation because of the hostilities of Nigeria and foreign Security or DSS, Police, Army, etc. Today we (Biafra – SS & SE) are advising all Biafrans (SE &SE) to stop street and other forms of protests to avoid contact with the hostile and angry agents of the Boko Haram and ISIS state of Nigeria that are crying in Nigeria and oversea because new Biafra (SS & SE) is LEAVING state of Nigeria. All members in attendance supported this contribution. Representatives of the IPOB, MOSSAB, OHANEZE NDI IGBO, RADIO BIAFRA, ETC. moved to say, you can see that several leaders did not attend this meeting because they are working with Buhari, Osinbajo, USA, UK, oil/gas companies and they are receiving billions of dollars,.euro, and pounds to organize protests because is through protest they disorganize the plight for the emancipation of new Biafra (SS & SE) reason that they will arrest and detain our human resources and delay our push for the Referendum in Biafra. This supported by The Endowed Prof. (Dr.) Phillip Chukwuma Ofume and Associates. 9.a. The Endowed Prof. (Dr.) Phillip Chukwuma Ofume. Introduction: In-Brief 2-3 minutes per attendee and confirmed by the Chairman and moderators and confirmed. 25.d. Biafra Judges, army, police, custom & excise, security operatives, etc will be the most paid in the world to teach the world that these work men and women are service people with dignity and astute service honor to make sure bribery and corruption; lobby and being lobbied will be totally be eliminated at the rate of over 100% because all monies disbursed will be published and one kobo will be monitored under continuous and comprehensive check and balance. .The security and elimination of bribery and corruption; lobby and being lobbied is continuous and comprehensive assessment and evaluation under direct, walk-in check and balance under expenses monthly auditing and balance of all national accounts and the thief will go to almost life in prison and loss job with publishable credit and change of name and status because the monitoring excise goes from the president and vice-president to the lowest government, public and private servants. Government, public and private servants must pay taxes to the government of Biafra (SE & SS). 25.e. To avoid do or die political campaign entry and finishing points, Biafra (SS & SE) president, vice-president, LGA, state, federal representatives and senates lawmaking body will be conditioned to services to the people and not for high wages, gold digging and looting exercise oversea and in Nigeria because their wages will be low and within middle class wages category to cut the motive of Biafrans (SE & SS) into the path to imitate them to engage in dangerous businesses such as bank and other stealing and robbery, drug business, etc. In Biafra (SE &SS) there will be no thief, “419”, looting and flight, foreign and domestic political funding. no president, vice- president, senators, federal, state, LGA representatives, diplomats, governors, high commissioners /ambassadors, corporate body, etc will enjoy any immunity and if you wanting for stealing one kobo less than one minute upon taken oath of office; president, vice- president, senators, federal, state, LGA representatives, diplomats, governors, high commissioners /ambassadors, corporate body, etc. will be arrested, investigated and if crime fund he/she will be charged and if convicted will leave his/her office to prison and 100% of the his/her properties, goods and other things will be seized. Looting in Nigeria and other nations is difficult to recover after stay in office; apart spending and dispersing them in secret and overt banks and financial institutions, they misuse the fund and the diplomats that help them steal major part and move to kill them and call cops for them to convict them and divert several parts of the loots. Leaders of the World, IMF and other banks and financial institutions are looters and no longer sincere like the time they sent this (http://universal-fashion-art-music.blogspot.ca/2014/03/political-manifesto-ofume-president-2015_10.html Page 44) to Chief Kudirat Abiola’s prophet (Pastor Moses Chiejina). 25.f. Biafrans will resolve all disputes such as poverty and others under alternative justice mechanism because all discontentment will be mediated and resolved with early intervention and resolution because all Biafrans (SS &SE) will be requested to send grievances which will be brought to peace and reconciliation committee will go to Board of Peace immediately and that is why the Obi, Eze, Chief, Chairs of the LGA etc will have annual working budget to work from the grassroots to the high-roots to recognize all Biafrans (SE & SS) and quickly capture what they are doing on daily basis and raise act of subordination to the governing authorities ( Obi, Eze, Chief, Chairs of the LGA, president, vice-president, LGA, state, federal representatives and senates lawmaking body) to resolve the emerging conflicts. https://groups.google.com/forum/#!topic/soc.org.nonprofit/NZJXHPqC1nE. 25.g. In Biafra (SS & SE) it is wrong for a witch or wizard to endanger the business and life of Biafran (SS & SE) and claims that he is a Christian and membership of other churches and as such he will not answer the summon of the Eze, Obi, Chief, etc. In Biafra (SS & SE) the orthodox and traditional doctors will be separated and recognized and fully approved and licensed to open their clinics and hospital and incorporated in the curricula of schools, K – Tertiary level. There will be multiple interaction between authodox system and traditional system. 26. Unification of SE & SS; Meaning of Biafra (SE & SS); introduction of agenda and how it will proceed; and reason we must leave state of Nigeria. – The Endowed Prof. (Dr.) Phillip C. Ofume. Chair and moderators call the floor to intervene. 26.b. Women Movements in the SS: Western and northern Nigeria are enemies of Biafra (SS & SE) and in Lagos for example Biafra (SE & SS) are bulldozed and goods are looted without sympathy. Go to lower and upper norths the hate is strong that they kill Biafrans (SS & SE) and chop them into pieces. Now Buhari is planning secret over-run of Biafra (SS&SE) to kill all Christians to establish Sharia and Caliphate Laws and any Biafra (SE & SS) that failed to obey them must be killed. 26.c. Ohaneze Ndi Igbo: we fled Kano to Lagos and in Nigeria the yorubas are telling us (Baifra) to leave to Biafra (SE & SS) because Lagos is for the Yorubas and that if we don’t they will immediately move to break into our home and stores cart away with our properties, goods and cash. During part of the 1968 the Edo people hate Biafra (SS & SE) like the Hausa/Fulani and Yorubas and several people from Agbor and eastern region were killed by the people of Edo and the Hausa/Fulani follow them to the houses of the Igbos and of the Niger Delta people to kill them. Then they follow the hausa/fulani soldiers to Agbor where they became pointers to show them (hausa/fulani and yoruba) the people of Agbor; Umunde, aniochas, etc to kill them. 27. Brief Introduction and analysis of the Nigeria/Biafra war 9-30 minutes and Why Biafra lost Nigeria/Biafra war – 9-45 a.m.by The Endowed Prof. (Dr.) Phillip C, Ofume: Biafra (SE & SE) lost the war because of the lies and secret lobby of the western nations. If I was President Odimegwu OjuKwu I would have selected the best soldiers of Biafra (SE &SS) and design commando, nomadic and clandestine strategies to over run lagos around 2-00 a.m. and with over 200 soldiers on plain clothes to meet at set time in Aso Rock, Lagos and changed to Nigeria army uniform to capture sleeping and awake soldiers and go straight into the bedroom of Gowon and capture and remove him out of Lagos to Biafra (SE) and take him to appear before President Ojukwu to sign all papers relating to the Republic of Biafra. Another pointer is that Ojukwu would have used his power to call for referendum in Biafra and used his authority to use international UN law to remove Biafra from the State of Nigeria without fight. 28. Formation of Election and Referendum Committees in SE & SS with time frame complete process and proceedings – 10-11.00 a.m. Open to all members after the opening statement of The Endowed Prof. (Dr.) Phillip C, Ofume .The Endowed Prof. (Dr.) Phillip C, Ofume is suggesting that between Monday November 21, 2016 through Tuesday May 30, 2017 all Biafrans (SS & SE ) must return to Biafra (SE & SS) to start house by house or door to door grass root mobilization to mobilize all 16 years through over 100 years citizens of Biafra (SS &SE) to properly understand the purpose of Biafra (SS &SE) because the criminals (elders. some leaders of Biafra NGOs, USA, UK, France, Italy, oil/gas companies, etc) are deceiving them with the money which they looted from Biafra including the $500million which Nigeria President MUHD Buhari gave to Senator Hilary Clinton to fatally loss the Presidential Election on November 8, 2016. 29. Biafrans (SS &SE) will start to vote and voting inside and outside Biafra (SS &SE) will continue for 30 days and all Biafrans (SS & SE) of age referenced must vote. 30. The Endowed Prof. (Dr.) Phillip C, Ofume continued : all fake voters must be arrested and charge and if the votes are not verified and certified they will not be counted and added, the person or voters are not Biafrans, they will be arrested and prosecuted and the votes will be destroyed and will not be counted and added as the voters of Biafra (SS & SE). No illegal voter will be counted and tolerated because the electoral commission of Biafra (SS & SE) cannot take or give bribes and lobby or be lobbied. The electoral workers of Biafra are reviewed by experts trained and certified by the electoral commission of Biafra (SE &SS) and all votes must be traced to the homes of the voters who are only Biafrans (SS &SE) before they are added and certified and recorded as the official voters of Biafra. 31. Mark-up of the date of Biafra Referendum inside and outside Biafra (Biafra and Oversea) 1.00 p.m. – 1.45. p.m. IPOD entered suggesting in the first to ask when the Biafrans (SS & SE) will vote and how? Dr. Don Etiebet entered by saying that the Biafrans (SS & SS) inside and outside must vote if there are 16 years of age they are Biafrans (SE & SS) born inside and outside Biafra (SE & SS).The Endowed Prof. (Dr.) Phillip C, Ofume said that Biafrans (SS & SE) have right to multiple citizens as they desire. IPOD & MOSSAB entered and The Endowed Prof. (Dr.) Phillip C, Ofume: called for an order that IPOD should continue to complete his address on the Referendum. IPOB was firm in the talk about the security of Biafrans (SS &SE) during the preparation of the Referendum. Dr. MacDonald entered to address the house on the previous meetings that Avengers and other Civil Liberty Fighters will be mobilized to protect Biafrans (SS &SE) during the campaign and voting period. International Community has requested The Endowed Prof. (Dr.) Phillip C, Ofume & Associates whether they want protection during the preparation campaign and voting period but Biafra (SE & SS) will respond to them if want help. 32. MOSSAB entered and ask the house, how long is the voting going to take. The Endowed Prof. (Dr.) Phillip C, Ofume entered to respond to the question of the MOSSAB which has been responded above. Restating. The Endowed Prof. (Dr.) Phillip C, Ofume: said that campaign will start on December 5, 2016 and end on May 31, 2017 and voting will start June 3, 2017 and voting ends on Monday July 3, 2017 and result will be announced on Tuesday July 4, 2017. 33. FUNDRAISING TO SUPPORT BIAFRAN (SE & SS) REFERENDUM IN BIAFRA (SS &SE) AND STRATEGY OF THE COMMONWEALTH BANK OF BIAFRA (SS & SE): All Biafrans (SS & SE – youths, adults and seniors) must contribute/donate any amount (Symbolic 1Naira is Ok) to the Commonwealth Bank of Biafra (SE & SS) which will be opened in December 2016 to run the business of Biafra (SS & SE) and each state of Biafra (SE & SS) must have one Commonwealth Bank of Biafra (SE &SS) which will be opened in each state of Biafra (SS & SE) with the signatures of each state and citizens of Biafra (SS &SE) and the content of the account must be published every month of the year and 12 months to enable all Biafrans (SE &SS) the citizens, governors and with completed signatures of the governor,deputy, LGA, Obi, Eze, Chief, etc on the opened Commonwealth Bank of Biafra (SE & SS) and without these signatures the Central Bank of Biafra will not deposit money in the account. Under these solid foundations, looting, fraud and misuse of public fund will not be possible in Biafra (SS &SE) and if you are a thief like in Nigeria do not come to live in Biafra (SE &SS). 34. In December 2016 the first account of the Commonwealth Bank of Biafra(SE &SS) will be opened by the following signatures ( The Endowed Prof. (Dr.) Phillip Chukwuma Ofume & Associates; AVENGERS,OJUKWU BIAFRA AVENGERS (OBA) AND OTHER CIVIL LIBERTY FIGHTERS, MOSSAB, IPOB, OHANEZE NDI IGBO, WOMEN (SS & SE), REPRESENTATIVES OF THE MEND (MILITARY & CIVILIAN) , GEN. TOMPOLO, RADIO BIAFRA, GEN. ANSARI, GEN. HENRY OKAH, ETC. The vote in November 5, 2016 was 100% “YES”. Ohaneze Ndi Igbo, IPOB. MOSSAB, Radio Biafra(SE &SS) said that the Commonwealth Bank of Biafra (SE & SS) will stop the looters and criminals from Nigeria from looting the wealth of Biafra (SE &SS). 35. MEND (MILITARY & CIVILIAN OF THE NATIONAL AND INTERNATIONAL CHAPTERS) & The Endowed Prof. (Dr.) Phillip C, Ofume and Associates (including Dr. Don Etiebet, Dr. Reid MacDonald, Dr. Cynthia Taylor et als) The Nigerians that have heart and world know what Biafrans (SS & SE) have suffered since 1889 to present time including murdering over 6.8 million Biafrans (SE & SS) between 1954 and present time because of hate, ethnic, religion, regional, race, etc. and no nation on earth including Israelis, Jewish, ethnic Albanians, and other ethnic. religion and racial groups have suffered what Biafrans(SE & SS). We are warning Jonathan, Clark, and other elders and leaders of Biafrans (SS &SE) that they must stop negotiating and dialoguing with the state of Nigeria and its allies because Biafra (SS &SE) has several hidden and overt and very angry arm groups and they will kill these elders and saboteurs. The present civil liberty fighters are true Biafrans and very harden and very anxious to kill any saboteurs. 36. 10. Selection of night and day times diplomatic missions by SE & SS delicate-select – 1.45.-2.00 p.m. Ohaneze Ndi Igbo asked what will be the duties of the day and night times diplomats? Their duties are classified and reserved because the mission can not go media but they will be in-charge of internal and external duties to organize election, collate and count votes and majority will be trained Lawyers to work with other diplomats, lawyers and nations within the International Communities. 37, 10. Selection of night and day times diplomatic missions by SE & SS delicate-select – 1.45.-2.00 p.m. 11. Fundraising strategies and methods 2.00 – 2.50 p.m. 3.30 p.m. Call for donation nationally and internationally to support the Commonwealth State of Biafra (SS &SE) and her Referendum as stated above. 38. In December 2016 the first account of the Commonwealth Bank of Biafra(SE &SS) will be opened by the following signatures and signatories ( The Endowed Prof. (Dr.) Phillip Chukwuma Ofume & Associates; AVENGERS,OJUKWU BIAFRA AVENGERS (OBA) AND OTHER CIVIL LIBERTY FIGHTERS, MOSSAB, IPOB, OHANEZE NDI IGBO, WOMEN (SS & SE), REPRESENTATIVES OF THE MEND (MILITARY & CIVILIAN) , GEN. TOMPOLO, RADIO BIAFRA, GEN. ANSARI, GEN. HENRY OKAH, ETC. The vote in November 5, 2016 was 100% “YES”. Ohaneze Ndi Igbo, IPOB. MOSSAB, Radio Biafra(SE &SS) said that the Commonwealth Bank of Biafra (SE & SS) will stop the looters and criminals from Nigeria from looting the wealth of Biafra (SE &SS). 39. 12. Re-emerging plans in SS & SE – Adoption of the national capital of Biafra in Enugu, Biafra & raising concern and entering affirmative agreement – 4.05 -4.30 p.m. Women delegates from Biafra (SE & SS) before today they were several meetings of Biafra (SS & SS) and in these meetings The Endowed Prof. (Dr.) Phillip Chukwuma Ofume & Associates; AVENGERS,OJUKWU BIAFRA AVENGERS (OBA) AND OTHER CIVIL LIBERTY FIGHTERS, MOSSAB, IPOB, OHANEZE NDI IGBO, WOMEN (SS & SE), REPRESENTATIVES OF THE MEND (MILITARY & CIVILIAN) , GEN. TOMPOLO, RADIO BIAFRA, GEN. ANSARI, GEN. HENRY OKAH, ETC. The vote in November 5, 2016 were 100% “YES”. Ohaneze Ndi Igbo, IPOB. MOSSAB, Radio Biafra(SE &SS), The Endowed Prof. (Dr.) Phillip Chukwuma Ofume & Associates moved the first Motion and Application that the capital of Biafra remain at Enugu. 40. 13. Formation of the First Presidency of Biafra (SS&SE) – Nnamdi Kanu (SE) 4.35 – 5.00 p.m. and 14. Formation of the First Vice-Presidency of Biafra (SE &SS) – Phillip Ofume (SS) 5. 05 – 5. 25 p.m. IPOD & Ohaneze Ndi Igbo, Women Movements of Biafra (SS&SE), MOSSAB, MEND (Civilian and Military), etc mounted strong support for the presidency and vice-presidency of Ofume and Kanu and the votes were 98.1%. On November 5, 2016 at 4.50 p.m. that want their names reserved and classified opposed Comrade Kanu on point of age. The Endowed Prof. (Dr.) Phillip Chukwuma Ofume entered to tell them who Comrade Kanu is and requested them to go to watch him speak on Radio Biafra (SS & SE) to see that Kanu is like a man of over 70 years and that he is very smart, gifted, and talented and very in support of new Biafra (SE & SS). 45. 19. Wrap-up and multiple proposals 8.00-8.25 p.m.
45.b. Electric Power and Communications in all towns and villages in Biafra. Within one year in the office of the new Republic of Biafra (SS & SE) all the towns and villages will have Electric Power and Communications and export companies will open with diversified economies. 1. All the Biafran soldiers during the Nigeria/Biafra war will be recalled and relisted and those that are still able to serve will be listed and promoted and those that cannot serve will be promoted and retired with retirement pension and gratuities and continuous or monthly pension and gratuities. 2. All Biafran Armed Forces must have Mortgage projects to enable development of military housing projects across Biafra and better life of the military during and after retirement. 3. All the Civil Liberty Fighters (CLF) will be promoted and also maintain their present ranks and all the soldier will enjoy excellent service and promotion equity. 4. To get to any level inside and outside the armed forces across Biafra (SE & SS) there will be no nepotism, bribery and corruption, lobbying, etc. 49. POLICE, CUSTOM & EXCISE, DEPARTMENTS , ETC. 5. Best Police, Custom & Excise Departments , etc. with dignity and astute services across Biafra with heavy and attractive salaries and bribery and corruption will be 0% because of these attractive service incentives. 6. All Biafrans that lost their businesses during the Nigeria/Biafra and now will get free money of between $1million to $3million under well planned business plan and start-up sustainable projects and programs by the experts in the Department of the New Biafra Industry and economic development. 7. Senate, Federal and State Representatives will be structured on volunteering and services for the people of Biafra (SE & SS) with middle class salaries. 8. These services and salaries will make these Biafran men and women to do better representation for the people that elected them. 9. See the mess in the USA, Canada,Nigeria, UK, EU, AU, Asia,etc particularly in Nigeria where lawmakers are paid millions of dollars in wages and electing them becomes something worst than do or die business with massive bloodshed and they engage in looting and flight to return to office and pay back loan to conduct election. 10. What killed lawmakers across the world is political funding by godmother/father, governments and politicians. 11. Biafra (SE & SS) will be the best in the world with over 98% jump in standards and innovation in practical export and work centered education. 12. Because Biafra (SS & SE) will have a lots of money to expend in education at these levels, therefore, K, Primary, Junior/Senior Secondary, and First Degree will be FREE and from primary to first degree will be research, investigative, innovative, export, work, etc base education with teacher training colleges from K to tertiary level to enable Biafra (SS &SE) have better teachers to teach students from 8.30 a.m. to 6.00 p.m.
13. There will be two medicines in Biafra (SS & SE): Traditional Medicine and Orthodox Medicine and widely separated. 14. In both medicines they will be strong research and investigative institutes to focus on deadly cures of deadly illnesses (AIDS, CANCER, HIV, EBOLA, ETC).